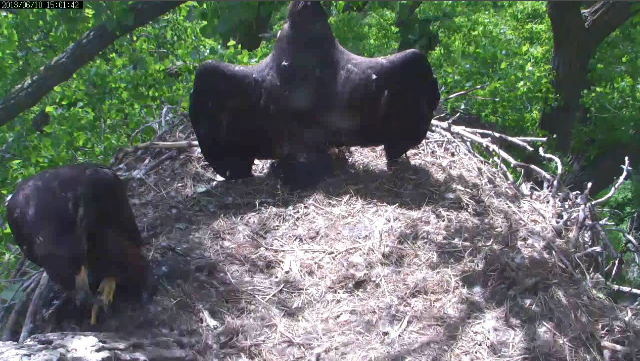 Nest Update June 10, 2013 - A Late Monday Blog! This blog is very late and I do apologize! I was on a production today that ran waayy long and I had no access to the nest or chat all day. I have been trying to catch up on the happenings today so forgive me if I miss something! 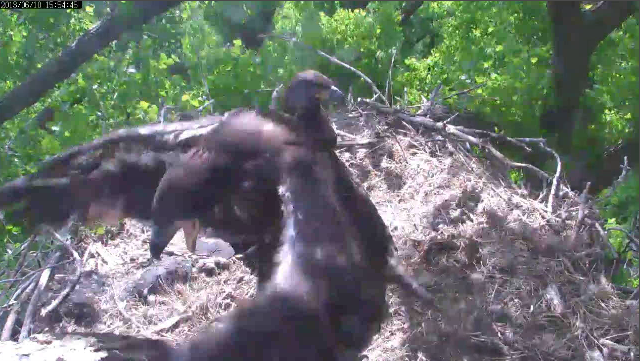 The day dawned beautiful and eaglets were left wondering where breakfish was. 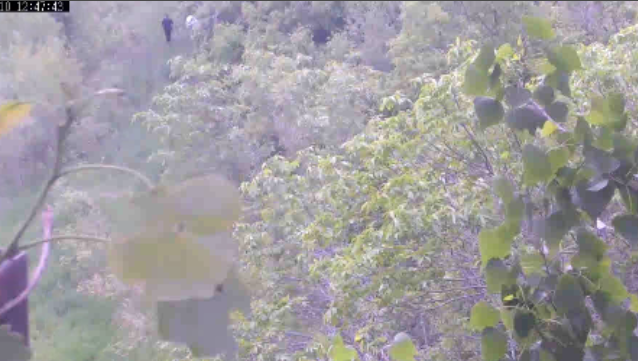 The morning passed pretty much without incident until around midday several voices were heard close to the nest. As well as I can piece together they were very rude and very loud. As being within 100 yards of an eagles nest when young are present is a federal offense we were actually listening to federal criminals and they are probably guilty of trespass as well as the nest is on private property. The authorities have been notified and are looking into the situation. If any of you living near the nest (you know who you are!) have any information about who was near the nest today, please let the local authorities know! Thanks! About midafternoon Peace was soaking up some rays at the far side of the nest and Harmony was battling gnats. The gnats were bothering Peace too so she started wingwhapping to try to drive them away. It seemed to help for a bit. A little bit later Mom landed with no food and got her feet bit by the kids as a reward. She stood there for a few minutes,then she left and the kids watched her go. Harmony decided the current food situation wasn’t to her liking and she threw the first hissy fit of the season. It was a beaut and worthy of inclusion in the Harmon Hissy Fit Hall of Fame. All the while Peace just sat in the middle of the nest with a “Who, Me? ?” kind of demeanor. When Dad did finally bring a furry snack to the nest the kids were so busy jousting over it Mom dropped down and claimed it from them. They both behaved as she fed them. Early evening the kids were engaged in some cornstalk wrestling when Harmony spotted something nearby that rated a call we have not heard from her before. She actually sounded a little bit like a duck! This type of call has been heard from eaglets at other nests and Harmon last year and may be a first attempt at a peal call with a young throat. We're supposed to be napping. What's your boss gonna think???? So, thats what crashed eaglet looks like! Atchooo! Darn gnats. Gettin' in my nose!! Hey Harmony, the mint wants me to pose for the next Golden Eagle coin. Don't they know I'm a Bald Eagle? A whap of the wing to Razzle and BBC for the marvelous pics and vids again today! Thanks! Hope you had a marvelous Monday and we’ll see you here tomorrow!